Ethics Commissioner Mary Dawson was warned as far back as September that Finance Minister Bill Morneau could be in a conflict of interest over a bill he was spearheading that benefits his family firm, but the federal watchdog didn't launch a formal examination until November when controversy over the matter had dominated the House of Commons for weeks. A group representing retired Canada Post workers hand-delivered a letter to Ms. Dawson's office on Sept. 18, outlining its concern about the Finance Minister's shares in Morneau Shepell and his involvement in drafting legislation to rewrite federal pension law. Bill C-27, sponsored by Mr. Morneau, opens the door for Crown corporations and federally regulated employers, including airlines, banks and telecommunication firms, to convert secure defined-benefit pension plans into less-secure target-benefit plans (TBPs). The Canada Post Pension Advisory Council told Ms. Dawson that Mr. Morneau was receiving dividends and income from his shares in his family's human-resources and pension-planning firm when he introduced the bill, which would shift the retirement savings risk to employees. Peter Whitaker of the council also pointed out that Mr. Morneau was executive chair at Morneau Shepell in 2012 when it purchased the pension administrative branch of Mercer Canada – the chief actuary for Canada Post. He told Ms. Dawson that Bill C-27 could benefit Mr. Morneau as a shareholder of Morneau Shepell because the firm stood to benefit from the shift to TBPs. At the time, Mr. Morneau owned one million shares valued at $21-million. "This will translate into increased cash flows to firms like Morneau Shepell. These actuarial firms would be the big winners if defined benefit pension plans are converted to TBPs," Mr. Whitaker wrote. "Minister Morneau should have known or reasonably should know that in making the decision to introduce Bill C-27 in October 19, 2016, he would be in a conflict of interest." Mr. Whitaker, who sent the same letter outlining the concerns to Mr. Morneau's office, urged the Ethics Commissioner to order the Finance Minister to recuse himself from any further dealings with Bill C-27 and investigate him for potential conflict of interest. Mr. Morneau has defended his actions, saying he followed Ms. Dawson's advice and used an ethics screen in which his chief of staff was designated to make sure he was not in a conflict of interest. However, he has acknowledged he did not recuse himself from discussions involving C-27, arguing that he did not believe his sponsorship of the legislation was a conflict. Ms. Dawson's office did not respond to Mr. Whitaker's letter, delivered about one month before the opposition parties asked her to investigate. On Nov. 9, Ms. Dawson announced an official examination of whether Mr. Morneau contravened federal ethics law when he introduced Bill C-27. Ms. Dawson's office, speaking to The Globe and Mail last week, defended its conduct. A spokeswoman said that while the Morneau inquiry was launched in response to requests from the NDP and Conservatives, "Ethics Commissioner Mary Dawson had been contemplating the matter for some time." After the questions from The Globe this past week, the Ethics Commissioner's office sent an e-mail to Mr. Whitaker on Friday to confirm her inquiry. Ms Dawson's office said the Conflict of Interest Act as currently written does not obligate her to launch inquiries from complaints filed from the public. NDP MP Nathan Cullen said Ms. Dawson should have started asking tough questions about Mr. Morneau's shares and Bill C-27 as soon as she got the letter from the postal retirees' council since she knew that the Finance Minister had not divested his shares or put them in a blind trust. "This is about the integrity of Morneau and Ms. Dawson's office," he said. "They either hoped the problem would go away or they didn't think it was a problem." Mr. Whitaker said he is disappointed with how Ms. Dawson handled his complaint but he is hopeful the controversy will force the Trudeau government to withdraw Bill C-27. "The legislation in our view is clearly tainted," Mr. Whitaker told The Globe. "They better get back to the drawing board and start from square one and really have proper consultations before they ever come back with a scheme that would have companies like Morneau Shepell get rich off our backs." Opposition parties note that Mr. Morneau advocated for a shift to these target-benefit plans when at Morneau Shepell and argue that the firm stands to benefit because existing clients might want to switch to target-benefit plans from defined-benefit plans. Also, they say, the new legislation would require actuarial valuations every year, which could mean more work. Mr. Morneau's shares in Morneau Shepell rose by nearly $1-million in value in the first few days after he introduced the legislation to rewrite federal pension law, which he had advocated for while still in the private sector. At the time the bill was tabled, Mr. Morneau was relying on an ethics loophole to continue to indirectly own one million shares in Morneau Shepell. As The Globe first reported in October, Mr. Morneau ran the Finance Department for nearly two years without putting his substantial assets into a blind trust. 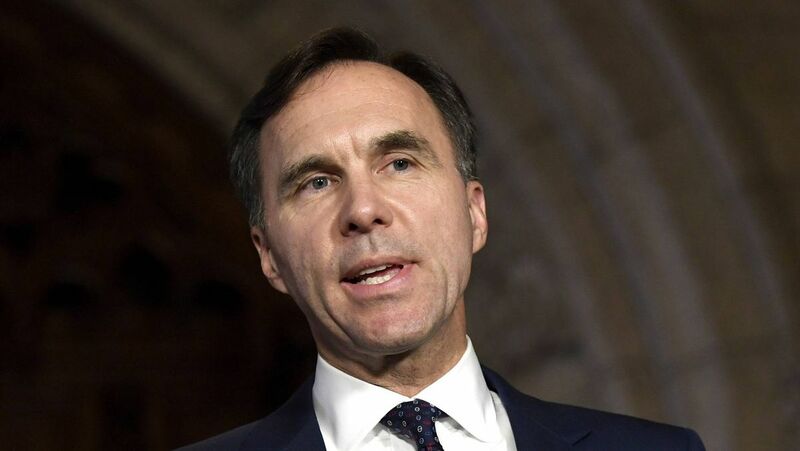 The Finance Minister has since reversed course and announced that he would put all his assets in a blind trust, sell off his entire portfolio of Morneau Shepell shares and donate to charity the $5.3-million in profit these stocks had earned since he joined the federal cabinet. When he was still executive chair of Morneau Shepell, the company founded by his father, Mr. Morneau helped sponsor a public policy forum on pension reform in October of 2014 that talked up the measures he included in Bill C-27.